A bird bill (also known as a beak) is a perfectly evolved tool attached to a bird’s head that functions, in effect, like a combination of a mouth and a hand. Bills are best known for eating; indeed, they have evolved to imbibe an extraordinary array of items, from fruit and seeds and nectar to insects and worms to fish and mollusks to birds and mammals. In search of food, they can detect invertebrates under thick mud, pry apart pine cones and mussel shells, grab slippery reptiles, and crush rock-hard seeds. But they aren’t just for eating. They can drill holes in trees, weave grass together into nests, carry sticks, clean feathers, exude excess salt, and dissuade predators. Below is a selection of bird bills from an array of birds taken both around Chicago and on Field Museum expeditions. See if you can guess what the bills are adapted for before reading the photo captions. 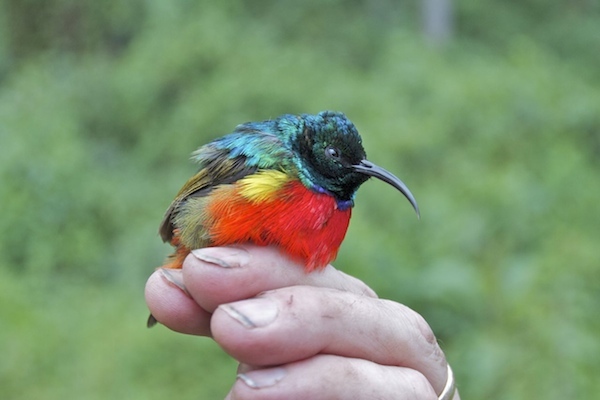 Sunbirds such as this Rockefeller's Sunbird, Cinnyris rockefeller, have long, thin bills that can be used to drink nectar or to catch insects. Photo by Josh Engel. Most finches, such as this Dusky Crimsonwing, Cryptospiza jacksoni, have thick bills used for eating seeds. This bird still had a piece of a seed sticking out the side of its bill. Photo by Josh Engel. This unsual-looking bird, White-headed Wood-hoopoe Phoeniculus bollei, uses its long red bill to pry insects from behind bark, under leaves, and other such hidden places. It also nests in tree cavities, which it helps keep clean with its bill. Photo by Josh Engel. 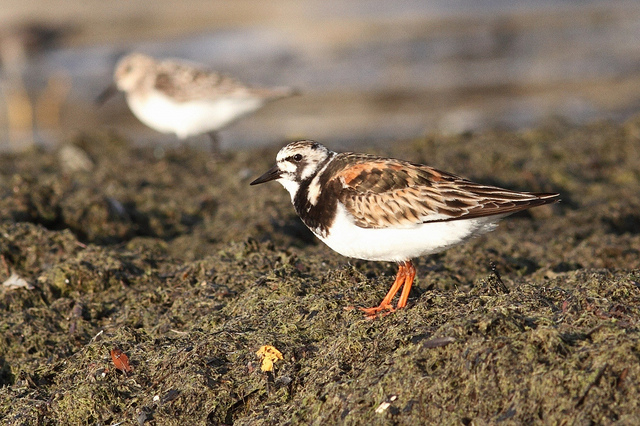 Ruddy Turnstone Arenaria interpres is a sandpiper that uses its bill to pry under rocks for invertrabrates. There are no rocks where this photo was taken in Chicago; here it picks bugs from on and under this mat of algae that washed up on the beach. Photo by Josh Engel. Short-billed Dowitchers Limnodromus griseus actually have very long bills that they use to probe deep into mud to find invertebrates. The tip of their bill is sensitive enough to find prey by feel alone. Photo by Josh Engel. 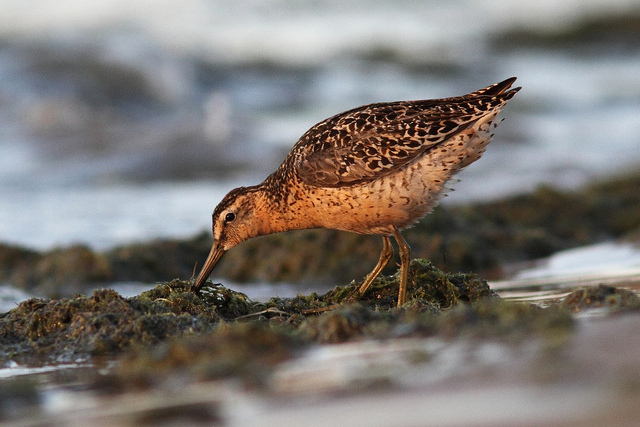 A "typical" sandpiper bill, long and thin for probing into mud and sand for invertebrates. Photo by Josh Engel. 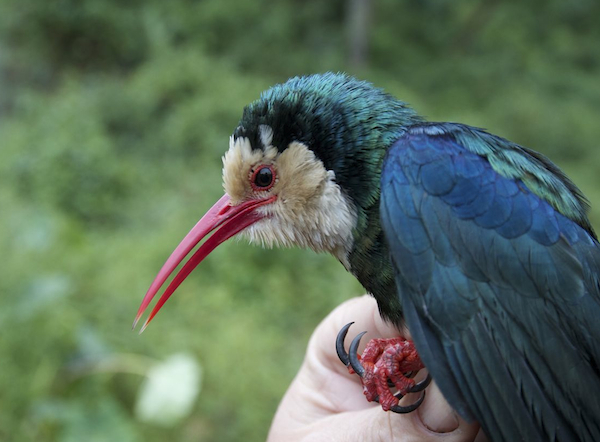 The endangered 'Akiapola'au has one of the bird world's most remarkable bills. Photo by Josh Engel. Pelicans have among the most distinctive bills in the bird world. Photo by Josh Engel. Birds of prey have hooked bills for ripping apart prey. Photo by Josh Engel.